When is a set not a set? When the Post and Go machine dispenses something really strange! The collector used three separate transactions to buy one Collectors Set, one set of 6 x Europe 60g, and one set of 6 x Worldwide 60g. Note that there is damage to the surface of stamp 06, with the Queens' head missing, and some damage above the back of the bird. Currently rolls are sealed with a small piece of peelable label, which - with care - can be removed without damaging the surface of the stamp. But if this roll is the remainder of one part-used when originally issued it could have been taped closed with totally different tape. But why was the Grebe where the Swan should be? The most likely explanation is that the Swan was damaged and was replaced by a different stamp from the (new) beginning of the roll. How, then, can we explain a similar occurrence on here in which the Mallard (next in sequence after the substituted Grebe) was substituted for another Swan? And there is another puzzle with the Worldwide strip: the receipt states that some items could not be printed - yet they all were, AND the message at the foot of the receipt states that 1 set of Letter Worldwide was presented ! Unfortunately the collector was buying so many different stamps that he didn't have a chance to examine everything until he got home. Only then did he see these anomalies! And I have absolutely no doubt that the collector concerned was not involved in interfering with the roll to change the sequence before printing. 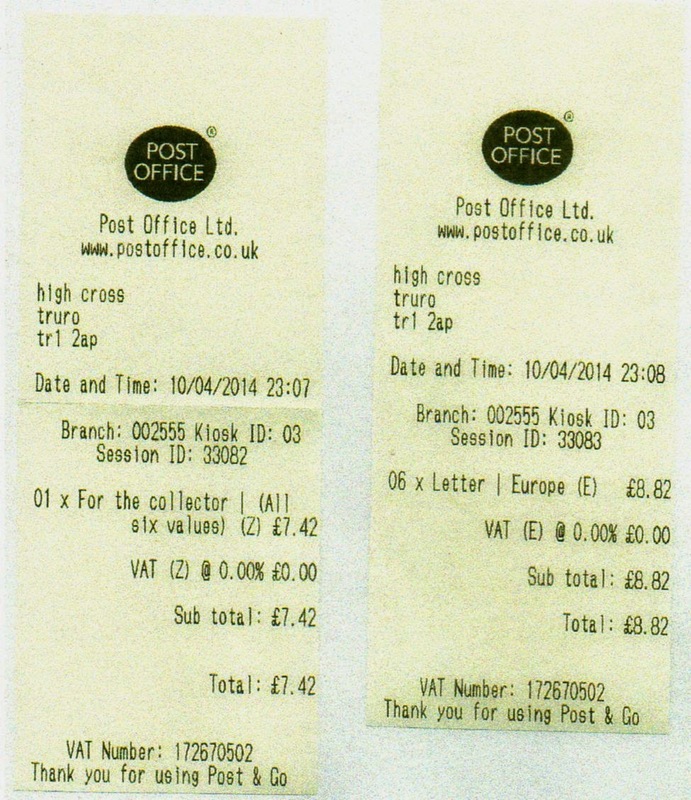 Interesting times on the receipts if they weren't interfering with the machine - does Truro have new opening hours? Thanks for reminding me about that. I knew the times were wrong, but forgot to mention that in the detail above. Truro again!!! Previously it was Truro that had Birds 1 on 40 grams. I will ask the Post Office investigation branch to investigate, maybe the same person used the same card if paid by a card, the office manager at least has something to answer for as it smacks of insider dealing, it also does not seem genuine philatelic use but keeping stock for misuse. Whilst there is clear evidence of wrong-doing in the past (Birds 1 at Yeovil which wasn't one of the original Birds 1 offices), there is nothing amiss at Truro. Initial distribution of Post and Go stocks was unable to take any account of usage simply because there was no history. Even after the Birds, there is no evidence that quantities supplied took any account of actual machine usage, as opposed to the "stock issued less stock returned" formula. In fact there was no requirement to return unused stocks. Branches were required to install new stamp stock on the official date of issue, which meant that part-used and unused rolls of the previous issues were kept in stock locally, to be installed in the machines should the need arise, ie if stocks of a subsequent issue were exhausted. NCR machines are unable to use these old issues due to a different sized central core being used, so it makes sense for branches with Wincor-Nixdorf machines to use them prior to conversion. Whilst there are reports of some branch staff being less than helpful to collectors and dealers, at other branches staff are pleased to be able to help collectors by changing machine contents on request. Considerate collectors and dealers make way for members of the public to use the machine(s) if necessary, but often they have 'free rein', and this does (of course) increase branch and Post Office Ltd corporate revenue. I have just taken delivery of supplies from another office in the south west, with the following session numbers on the same day. Nothing amiss, just very helpful branch staff who, by there helpfulness, will have enabled my customers around the UK and as far as Australia to acquire the 60g Europe and Worldwide stamps for several issues which I had though I would be unable to acquire. By the way, what do you mean by "genuine philatelic use". These are available for general non-philatelic use, ie by members of the public. I think we should remember that no Post & go issue has ever been withdrawn so far! So if various Post & Go rolls are in stock in the Post Office, they can be put in a machine without breaking any rules at all!!! Has it occurred to your over suspicious mind that Truro is a little used office? How do you know? I know quite a lot of people who have used this outlet to obtain a significant amount of Post & go items for philatelic use over the last few years!